Apostles Of Divine Mercy | Fr. J. Vettiyankal V.C. Thanks so much for all those beautiful prayers from Fr. Jose and videos of Fr. Sears. I passed them on to my brother (63) in Indiana who is just learning how to say the Divine Mercy chaplet and the rosary at dad’s bedside. He and his wife even went to Poland last year but didn’t know about the Divine Mercy Shrine. The information you sent is the perfect supplement to the little bits of information that I started to teach him while I was home. 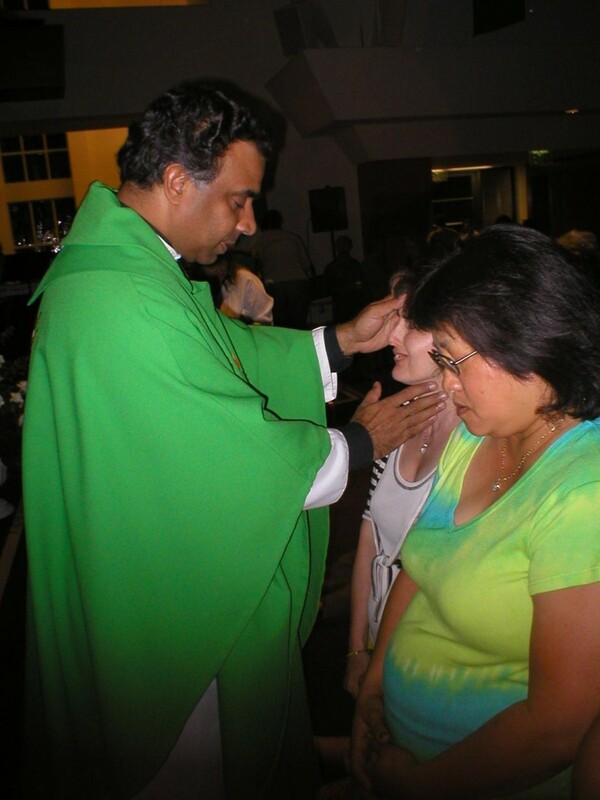 He has never had the opportunity to attend a healing mass so the virtual tour is wonderful! Thanks for all the time and service you give at St. Mel’s and for the Lord. Fr. Jose called out that 5 people are receiving healing at their work place. The next morning I went to my workplace and heard that some changes were made there. The situation had turned 180o in my favor. Thanks to God for the wonderful things he has done for me and my family. I am writing on behalf of my friend, Olie whom I have accompanied yesterday and attended Fr. Jose’s healing mass. She have been suffering from severe back pain for the last 11 days that she needed to go to ER for treatment. She was given pain killers like valium, morphine and even therapy but nothing helped. So I called her Tuesday and told her I will take her to the healing mass at St. Mel which she has never visited. So we went and after the service she said the pain is still there. This morning she called me and said she has been healed, pain completely gone. She was crying and I was too. Praise the Lord! Footnote: Olie is a seamstress and was unable to work because of the pain and a frozen shoulder. Praise the Lord! A friend from St. Mels told me about the Divine Mercy prayer and novena on Wednesday night. I started going and have received mercy, grace, peace, inner emotional healing and restoration. I brought my teenage son Chad age 16 and daughter Ashley 19 they also said they received grace, mercy, peace and felt a close presence of Lord with them when they were prayed for. I invited my sister-in law Sherri to come to the healing mass on Wednesday with Rev. Fr. Jose Vettiyankal. She had never experienced a charismatic service before and had not been to church in a while. She was experiencing problems with some co-workers on her job. She was put on probation and facing termination. As we prayed, Father said there were five people that had job related situations and that the Lord was going to intervene on their behalf. She said she experienced cleansing and forgiveness of her sins when she went to the altar for prayer. The Lord touched and healed old hurts and wounds. She said she experienced the peace that passes understanding that night. The next day, her supervisor called her and the job situation had changed in her favor. She did not lose her job! She is praising and thanking God! She has renewed faith telling everyone what the Lord has done! I wanted you to know of our gratitude and appreciation for this ministry. God Bless You, We thank and praise the Lord. I attended to the mass celebrated in 10/1/08 with the Fr. Jose who came from India, and I want to tell you that I recived the Holly Spirit and also I fell my heart relaxed, before I alway feelt opprecion in my heart also I had a pain in my heel and disappear, but the most important I feel happines and peace in my heart. I hope to have the opportunity to attend to all other healing mass and I feel so blessed that God touch my heart. On June 13, 2008 my family received the devastating news that my forty year old bother- in- law had brain cancer. It was diagnosed as a high level grade 3 tumor called anaplastic astrocytoma located in the cerebrum. It is a tumor which could not be removed only treated with chemotherapy and radiation. The survival rate is only 10 percent with this type of brain tumor. I found St. Mel Church and attended a service in September. At the end of the prayer session it was announced that we could go up front and they would pray for us. When Claudia came and rested her hand on my head and began to pray for me, I began praying and begging God to heal my bother-in-law. Claudia stopped praying and asked me, who I was praying for, because she felt that I was praying “Really Hard” for someone and not for myself. I told her who the prayer was for and we both prayed together. At the end of the service I left with peace in my heart. I returned again to the mass and healing service with Fr. Jose. One week later my family received the good news from the Doctor that the latest brain scan did not show any cancer. It is a miracle! Praise to the Father, the Son and the Holy Spirit! Praise, Glory, and honor to our Heavenly Father through our Lord Jesus Christ always and forever, amen! The healing mass by Fr. Jose Vettyankle was awesome. I felt the peace and joy of the Holy Spirit in me. Also, God restored his peace in my family. Praise be to our Lord Jesus who has done marvelous things for us. We love you Jesus. We praise You and give you glory all the days of our life. Thanks for coordinating the event. I believe I was one of the ones that was healed. I claim the healing. I have been having headache on the left side of my head for weeks now. In the back of my mind, I’m thinking maybe it’s aneurysm of maybe a brain tumor. I was praying for my son Alex, but during the mass, my headache on the left side disappeared and I felt very refreshed. I also felt this warm/ slightly cold feeling on the left side of my head. It’s hard to explain. Praise be to God! Alleluia! My name is Judith Bertrand. A friend from St. Mels told me about the Divine Mercy prayer and novena on Wednesday night one day when we began praying for Kaelin, the child with cancer at the school. Since June 2006, I started going and have received mercy, grace, peace, inner emotional healing and restoration. I brought my teenage son Chad age 16 and daughter Ashley 19 they also said they received grace, mercy, peace and felt a close presence of Lord with them when they were prayed for. I invited my sister-in law Sherri Bertrand to come to the healing mass on Wednesday, July 12th, 2006 with Rev. Fr. Jose Vettiyankal. She had never experienced a charismatic service before and had not been to church in a while. She was experiencing problems with some co-workers on her job. She was put on probation on Tuesday, July 11, 2006 and facing termination. As we prayed, Father said there were five people that had job related situations and that the Lord was going to intervene on their behalf. She said she experienced cleansing and forgiveness of her sins when she went to the altar for prayer. The Lord touched and healed old hurts and wounds. She said she experienced the peace that passes understanding that night. The next day, her supervisor called her and the job situation had changed in her favor. She did not lose her job! She is praising and thanking God! She has renewed faith telling everyone what the Lord has done! I wanted you to know of our gratitude and appreciation for this ministry. God Bless You, We thank and praise the Lord. I had very difficult situation at my workplace. During the healing mass at St. Mels Fr. Jose called out that 5 people are receiving healing at their work place.The next morning I went to my workplace and heard that some changes were made there. The situation had turned 180o in my favor.Thanks to God for the wonderful things he has done for me and my family. We may not have fear of enemies now, because we may be free from the fear of enemies. But we have so many other types of fear in our lives. When I was here in Logos in 2001, one family came here with a lot of fear in their minds. They had a child 8 months old, born blind. No eyesight. Thinking of the future of the boy, the mother was fearful. And also, the family members as well. I said to them, “Fear not, our Lord is alive!” so they participated in the Eucharistic celebration, the celebration of the death and resurrection of our Lord Jesus Christ, with signs and symbols, hymns and praise. They didn’t notice anything special in the eyes of the child. That night they took a train to Chennai to have better treatment there. By 11:30 am on the following day, they reached Chennai and went to the hospital. There, they noticed that the child was responding to the actions of the doctor. He was responding properly. Their fear was taken away! Joy filled their hearts! Yes, the Lord is alive to continue what He started 2000 years ago and He continues it for our benefit even today and He will continue to do it tomorrow and forever. Praise the Lord. Alleluia! Four weeks ago, I was in Berlin Vincentian Ashram. There we have started a Divine Mercy Center for the people in the city of Berlin. When I celebrated the Eucharist, I saw a man with crutches in both hands, helped by his wife and sitting on the wheel chair. He came for the participation of the Eucharistic Celebration. Jesus is the same in Logos, in Berlin, everywhere in the world and in Palestine. He is alive. He does what He did years ago. So we celebrated the Holy Mass for all, especially for the fulfillment of 9 intentions. At the end of the Holy Mass we had a short prayer for the sick people and I asked for their testimonies. I asked this man, especially, because I had perceived in my spirit that he was healed. I asked him to come forward He was sitting there, not responding, as if he was not healed. His wife provoked him and told him “give me the crutches and go.” He didn’t respond. She was angry with him and told him “all these years I have suffered, I carried you, I helped you. Now you are healed. Father asked you to come. Why are you sitting here. Go and give your testimony.” In response, the man got angry and muttered “my wife is angry with me in a holy place.” In a fit of rage, he gave the crutches to his wife and he stood up to walk. And walked all the way to the stage! What a wonderful testimony. One person took a video of it for the benefit of others who did not come. That day, that man went home fully healed. Praise the Lord! He was healed of his physical disability of over eight years. Praise, Glory, and honor to our Heavenly Father through our Lord Jesus Christ always and forever, amen! The healing mass at St. Mels on July 12th, 06 by Fr. Jose Vettyankle was awesome. I felt the peace and joy of the Holy Spirit in me. Also, God restored his peace in my family. Praise be to our Lord Jesus who has done marvelous things for us. We love you Jesus. We praise You and give you glory all the days of our life. About 5 years ago, when I was here Banglore in Logos, a father, mother, and their child came here. The child was crying very loudly shouting “kill me, kill me, don’t allow me to live. It is over.” He was suffering from a horrible disease. There were blisters and boils all over the skin and there was bleeding also inside the skin. And small drops of blood were coming out. His mother was wiping away the blood from his body. It was so painful that the boy kept crying “kill me, it is better to kill me. I don’t want to live.” I told them, “ you must believe that Jesus is alive for you and for your son.” They agreed. I assured them that Jesus would heal their child if they followed the instructions. My name is Honey Vachaparambil. I stay in Chennai. I was suffering of Aneurysm – a deadly disease. Doctor Rao , the 3rd best doctor in India, who treats Aneurysm and does surgery for the cure of the same, informed me that I would undergo a brain surgery on last Good Friday 2003. Meanwhile, I came to Arulalayam Retreat Centre and did 9 days divine mercy prayers within a day as per the direction. I went home on that Wednesday and did the same prayer at home for 9 times with my husband and only daughter. That was the longest family prayer I did, because I am struggling between life and death, so I did my family prayer as if the last one. Following day I was admitted in the hospital. The same Dr. Rao said to me, No need of surgery, you are healed by your God’s mercy. I was discharged on Good Friday from the hospital. Thanks and praise to Jesus who has healed me. My name is Jonathan I was admitted in Appollo Hospital, Chennai. I am doing my 3rd year B. Com in Arakonam, Tamil Nadu. When I was in hospital, Divine mercy team members came from Arulalayam Retreat Centre and prayed over me according to the direction of Fr. Jose. I did nine days divine mercy chaplet and novena for my healing. Now I am completely healed. I gave my testimony in person at Arulalayam Retreat centre on 19th of July 2003. I give this testimony in this site for the upbuilding of the faith around the world. My name is Mrs. Whitaker. I am from Anna Nagar, Chennai. I was suffering of the tumor in my eye, which is suspected as a malignant tumor by the physician. But the Almighty God saved me and healed me through the divine mercy adoration in Arulalayam Retreat Centre in Ambattur. The same surgeon who told me I have a malignant tumor declared, I am healed without surgery and medication. Thank you and praise you Jesus. © 2019 Apostles Of Divine Mercy. All Rights Reserved.